The spirit of Yank Rachell and Johnny Young lives on Green Bay, Wisconsin bluesman Billy Flynn. 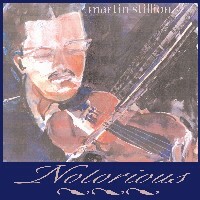 The erstwhile sideman and sometime bandleader is most frequently found playing guitar on the Chicago blues circuit, but as he proves on his new release, Chicago Blues Mandolin, he's absorbed the mandolin vocabulary of Rachell and Young, and has begun to make it his own. Billy wrote all 10 numbers on this disc (one of which appears in two different versions), sings, and evidently plays all the instruments (mandolin, guitar, resophonic slide guitar, bass, drums, and harp), except for help from Aaron Moore on piano on two cuts. All the tracks were laid in two days, which is no mean feat. 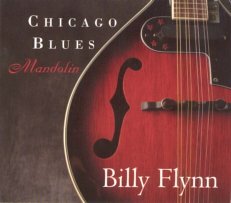 Billy's e-mando, as pictured on the cover, is a Rogue—a brand name used by Musician's Friend for Asian factory-made A-style mandolins with magnetic pickups. He tunes it a half step flat, to F#C#G#D#—or a whole step above Rachell's preferred EBF#C# tuning. Just so you know my biases, I'm not too fond of Asian factory mandolins in general. One in 50 might have some desirable tonal characteristics, but when I hear one I usually come away disappointed. Billy's Rogue sounds a bit stiff at times, and I keep wanting to hear what he could do with a better instrument. However, I might be tempted to trade one of my fancy expensive e-mandos for a Rogue if it meant I could play it like Billy. And after all, Rachell and Young both played inexpensive mandolins for most of their careers. The first cut, the instrumental "Mandolin Special," exemplifies what I'm talking about. It's a tasty concoction of signature licks from Billy's two muses, and he plays it flawlessly, but the Rogue's a bit pinched and nasal, a tad mechanical, and not excessively expressive. Furthermore, its pickup doesn't respond evenly, so there's a slight volume drop whenever Billy ventures down on the lower strings. Billy's guitar playing is fluid and relaxed throughout the disc (witness his fine guitar solo on "Jackson Street"), and I'd like to hear him bring some more expressive tools, such as bending and vibrato, over from guitar to mandolin (yes, that is possible, at least on some mandolins). The mandolin break on "Why Did You Go?" sounds a lot more spontaneous, and throughout the disc there's plenty of expert rhythm and backup mandolin to support Billy when he's soloing on harp or guitar, or laying down another tough-luck lyric in his world-weary baritone. The concluding instrumental, "Billy's Mandolin Boogie," is a barnburner, with lots of lower-string drones supporting the melody. Not quite as tricky as a Jethro Burns chord solo, but lots of fun nonetheless. Tonally, however, the material simply deserves a better instrument. I have several Yank Rachell recordings, and I must confess that some of them have a few too many rough edges for me. So I appreciate Billy's professionalism on this disc: everything's tight, in tune, well rehearsed, and tastefully arranged. I am aware of a few other blues mandolinists keeping the faith for Yank and Johnny, but so far only Billy and Rich DelGrosso have delivered full-length records focused on the mandolin (at least as far as I know). This CD sets an early 21st-century milestone for the genre, and belongs in the collection of any fan (heck, it might earn the genre some new fans). You can buy it directly from Billy. I hope it's just the beginning of big things for him, and for electric blues mandolin. Very helpful review--not just regarding the recording, but because I was thinking of buyng a Rogue ac-elec mando--thank you.